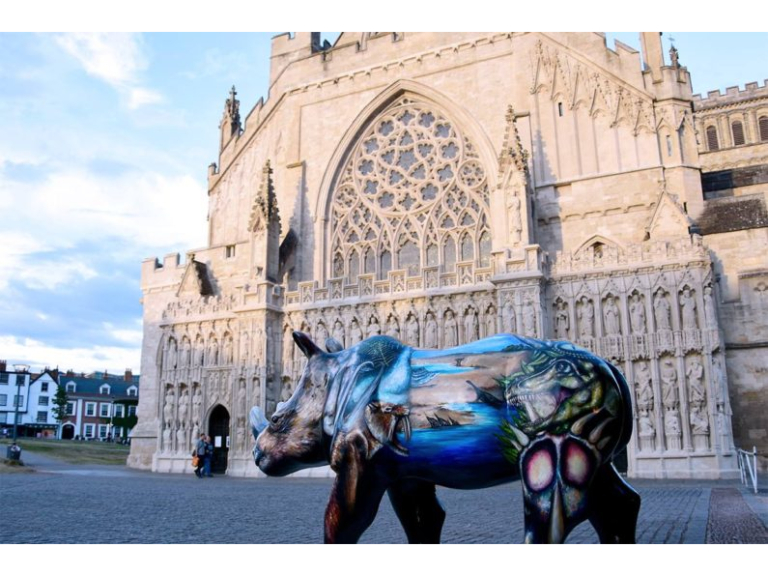 They are among 40 that form The Great Big Rhino Trail, a free public art exhibition scattered around the streets, parks and open spaces of Exeter and the English Riviera. Money raised by the trail and by the auction of the figures in November will go to rhino conservation. Paignton Zoo spokesperson Phil Knowling: “The rhino in the Guildhall Shopping Centre in Exeter was vandalised, but with some others we don’t really know whether the damage is malicious, accidental or because people love them so much they can’t keep their hands off them! We want the thousands of people who are following the trail this summer to see them at their best – imagine how upset children will be to see a rhino that has lost an ear or been scratched or cracked. “Also, they are valuable to us because they will be auctioned to raise money for rhino conservation. If they are damaged, then we may not be able to sell them and so will raise less money.” The Project is raising money to help the Sumatran rhino, which is Critically Endangered, with fewer than 100 in the wild, and the Javan rhino, which is also listed as Critically Endangered – experts believe there are no more than 60 left in the wild. One rhino has had an ear broken off twice, another has been hit in the face with a brick. Others appear to be suffering damage because people are sitting on them, despite signs asking them not to climb on the sculptures. Plastic Surgeon Fine Finishers, nationwide surface repair specialists based in Bovey Tracey, are partners in The Great Big Rhino Project, and have a Rhino Repair Squad ready to tend to injured rhinos. In Torquay, Sun’s Out, Horn’s Out was damaged due to people constantly sitting on it. There were more than 40 cracks which took Plastic Surgeon 6 hours to fix. The rhino has now been cordoned off for the remainder of the Trail to save it from further damage. “A lot of people on social media were very upset when the vandalism occurred in Exeter. We hope the public will look out for the rhinos and ask – politely – for people not to sit on them. We’re using the hashtag #RespectTheRhinos to try to make people more aware.” The Great Big Rhino Trail runs until Sunday 9th October.